Steampunk: A sub-genre of fantasy and speculative fiction that came into prominence in the 1980s and early 1990s. The term denotes works set in an era or world where steam power is still widely used—usually the 19th century, and often Victorian era England. Nicho: Made from mixed media and traditionally combine elements from Roman Catholicism, mestizo spirituality, and popular culture. Attend this workshop and contribute to being "green" by recycling tin cans and turning them into wonderful works of art!Brittany will share with you various paint over and ink techniques. 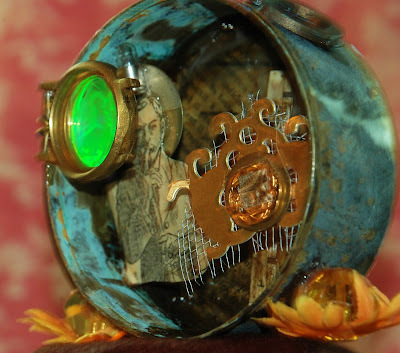 You'll also be using some found objects such as wire and broken jewels to create your nicho "Steampunk" style. please bring your favorite adhesive, photocoppies of any personal pictures or letters, scissors, needle-nose pliers, a hammer and any broken jewelry to personalize your creation. *You may register in person, or by calling 760-480-8114. *Please note, reservations cannot be accepted via email. *Registration will be accepted through 4:30 pm on Oct. 22, although the earlier you register, the better.